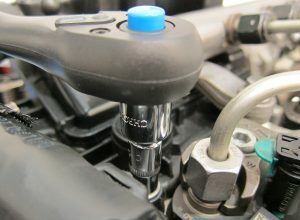 You’ve got a small fastener that’s got a high torque requirement, so you need a stronger driver than the standard 1/4″. A 3/8″ drive ratchet will fit the bill but you’ve only got a 1/4″ drive socket in the correct size. Now you’re sure you got an adaptor somewhere? But where is it? 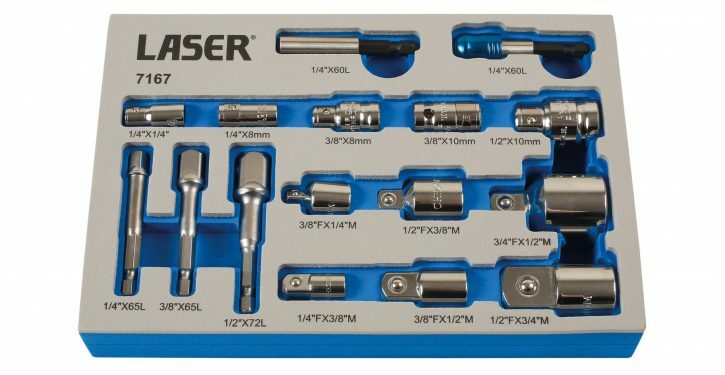 This new socket and bit adaptor set from Laser Tools supplies a comprehensive selection of the most-used adaptors presented in a machine-cut foam tray that fits neatly in the tool tray. You’ll never have to search for the correct adaptor again. The contents include: six socket adaptors (1/2″ drive to 3/4″ drive Male; 3/4″ drive to 1/2″ drive M; 1/2″ drive to 3/8″ drive M; 3/8″ drive to 1/2″ drive M; 3/8″ drive to 1/4″ drive M and 1/4″ drive to 3/8″ drive M). Five bit adaptors are provided: 1/2″ drive to 10mm hex; 3/8″ drive to 10mm hex; 3/8″ drive to 8mm hex; 1/4″ drive to 8mm hex and 1/4″ drive to 1/4″ hex. 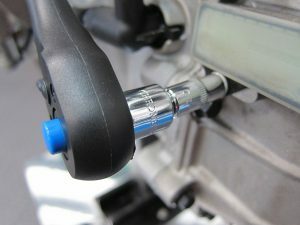 The bit adaptors are all provided with a spring-loaded ball to hold the bits securely. Three quick-chuck drill adaptors: convert to 1/2″ drive, 3/8″ drive or 1/4″ drive. Plus two quick-chuck 1/4″ bit holders, both 60mm long, one with a quick release function. This is the only socket adaptor set you will ever need, and it keeps all the adaptors secure in one place in the tool box. Available now from your Laser Tools stockist, typically priced at £52.42. Remember to check for the best prices and special offers. Provided in a shallow foam box which fits perfectly in a tool chest. We had 2-3 socket and bit sets but unable to mix and match the ratchet as it had a different drive, this set compliments them perfectly and makes our life a whole lot easier when working on bikes. Putting your bike into hibernation!